Infosys Share Price Results 2011 infosys Technologies Limited (BSE: 500209, NSE: INFOSYSTCH, NASDAQ: INFY) is a global technology services company headquartered in Bengaluru (Bangalore), India. Infosys is one of the largest IT companies in India with 127,779 employees (including subsidiaries) as of 2010.It has offices in 33 countries and development centres in India, China, Australia, UK, Canada and Japan.The company offers software products for the banking industry and business process management services also provides end-to-end business solutions. 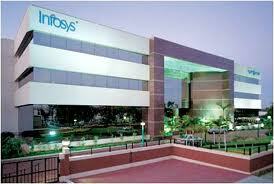 Infosys Technologies has reported fourth quarter net profit of Rs 1,818 crore, a growth of 2.15% over Rs 1,779.8 crore in Q4 of 2010-11. Revenues went up 2% to Rs 7,250 crore as against Rs 7,105.6 crore on quarter-on-quarter basis. Numbers were below the market expectations. EBIT margins declined at 29% in January-March quarter as against 30.2% in previous quarter.